Political Science Department, Simon Fraser University, Vancouver, Canada. Received September 29th, 2011; revised October 30th, 201 1 ; accepted Novemb e r 9th, 2011.
commitments, though the class-based theor izing is very clear about pur suing the soc ial control of markets. departments dedicated to European stud i e s .
polities would refer them into history. ologists, historians, anthropologists, legal scholars, and so on. literature is very challenging, and little researched thus far. dies located in Denmark, at Aalborg University. EU, for instance, resists attempts to fix its territorial boundaries. regions, and regions above the nations-state, or macro-regions. explicitly referring to someone’s divergent usage of them. the Organisation for Security and Cooperation in Europe. differences between pre-Waltzian and Waltzian standpoints. absolute gains from a cooperation. (a) Systemic theories: 1. Neo-realism (Waltz, Walt, Mearsheimer) and 2. “lock in” them, as in Majone) . formed by like u nits is studied a s a system in its own right. succumb to demands for institutionalization. mic approaches to the international affairs than he was in 1988.
trine targeted exactly this segment of “secondary state” behavior. mercantilist competition would be beneficial for the discipline. than by the neorealist accounts. 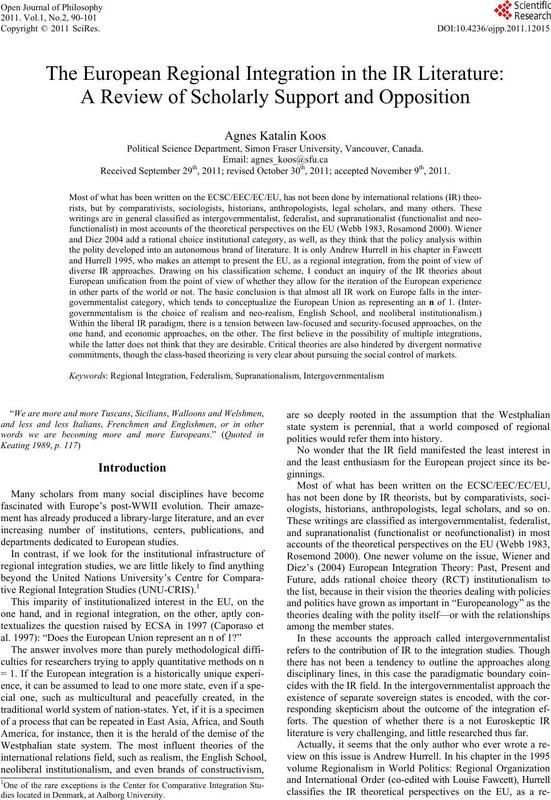 back to the problem of regionalization in 2007.
systems ma y p rofitably be applied to the study of the EU. is, in Hans Mor genthau’s disc ussion of the [ECSC & EC]”. tend to call it empty. constructivism, as exemplified with the Copenhagen School. ticular and reversible. The EU keeps being an n = 1.
description of what has happened in Europe. harmonizing the divergent ones, e.g. in disarmament issues. 4.
maintain and fuel further integration. not with planning (as Gunnar Myrdal imagined, for instance). lead to new “Westphalian” states. integration has not been halted, let alone reversed. driven rather than really popular. nomics won’t ever make its way into the high politics. Sandholtz and Zysman’s 1992 account). find increasingly unthinkable to wage war against each other). even in the absence of hegemonic pressures (but not against it). international regime, or an IGO, or a regional integration. to other state s .
ence-convergence hypothesis, is a matter of caprices of history). skeptical about its furthering (either deepening or enlargement). definition of various national business elites. description of the everyday workings of the integration process. methodology, and the non-testability of his proposals. exercise in description, rather than an explanation. 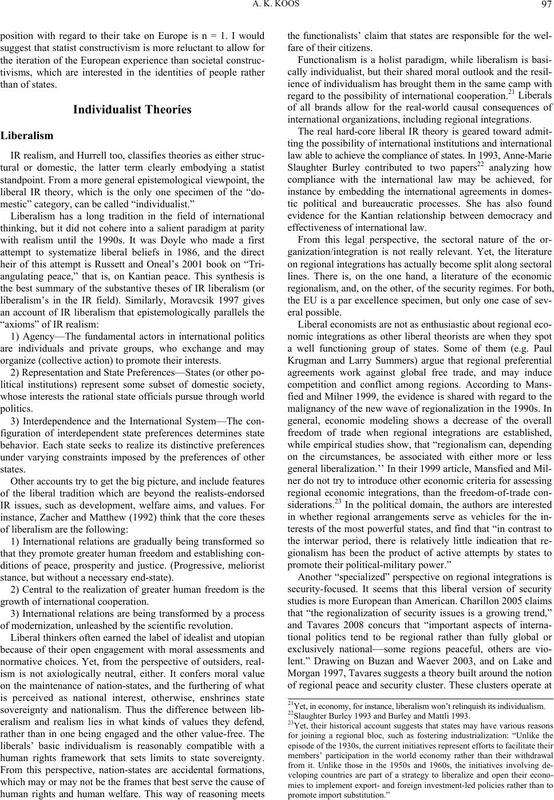 sociology, and affected IR in various ways. reduce harm to each other and p ursue collectiv e gains. become compulsory within a member state. 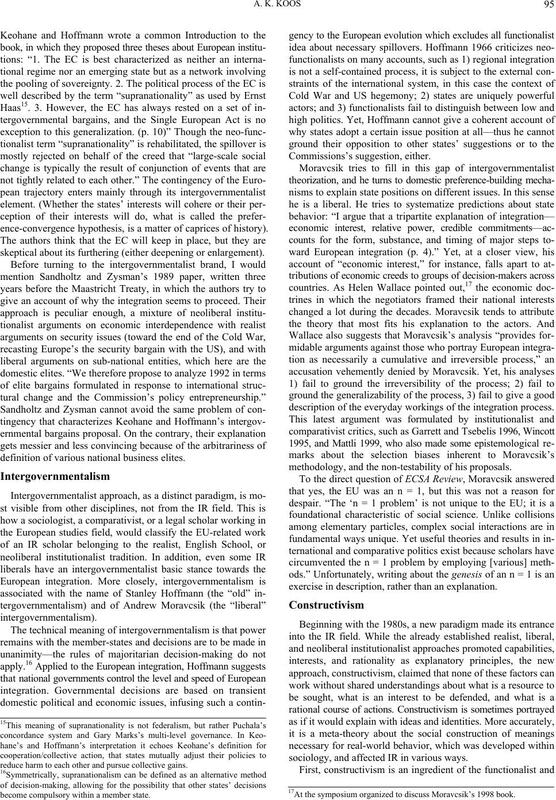 17At the symposium organize d to discuss M oravcsik’s 19 98 book. of a so-called “social constructivist” paradigm in the 1990s. nature or domestic politics. The second claim opposes realism. cannot explain structural change and so ought to be abandoned. parts of the inter-state system. activity that should be mentioned. mas Risse, Jeffrey Checkel a nd Thomas Diez in the same group? 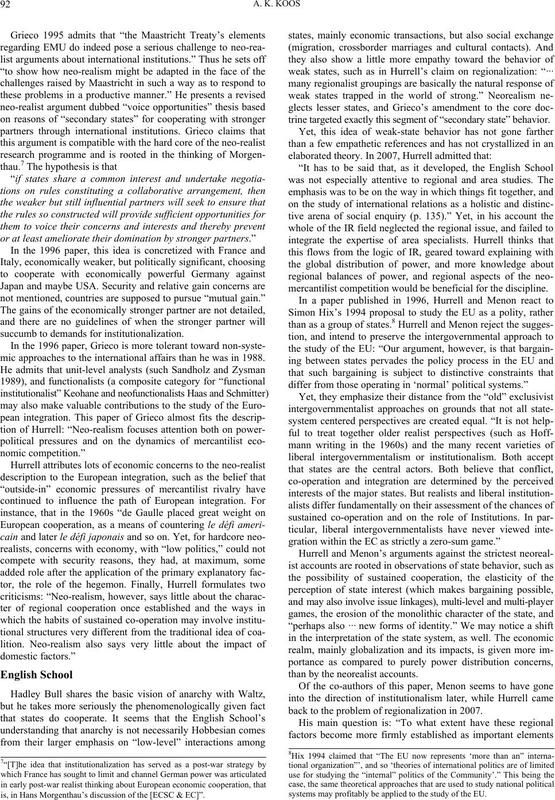 18Deutsch is quoted in Hurrell p. 65.
organize (collective ac t io n ) t o promote their interests. stance, but without a necessary end-state). of modernization, unleashed by the scientific revolution. human rights framework that sets limits to state sovereignty. international organizations, including regional integrations. effectiveness of international law . 21Yet, in economy, for instance, liberalism won’t relinquish its individualism. 22Slaughter Burley 1993 a n d Burley a nd Mattli 1993.
with the name of Gary Marks and Liesbeth Hooghe. listed among IR theories by Hurrell (as “convergence theories”). gences aided by institutions may emerge anywhere on the globe. sibility of regional integrations, and think about them in plural. narrative such as the functionalist. have the ambition to induce changes in it. and Africa, than the economy-based functionalist account. to make rules.” Legitimacy may be internal and external. modern standpoint relative to the issue can be outlined. fuel beliefs that women are less happy with the EU than men. (which is also often attributed to the EU). about neofunct iona lism’ s emph as i s on tr ansn at io nal in teres t groups. version of theory of supranationalism, which is disputable. ings, depart from these views. offer more support to integration. cus of the Left greatly lessens pressures for political integration. wealthy states more powerful to the detriment of the poor. World Social Forum, than by the European integration. shared language to foster solidarity). of non-political participants in policy formulation, for instance. have not elaborated on which scenario deserves most support. sino capitalism” that address these problems. 1987, after decades of Eurosklerosis. field, we have other approaches? in the real life, as evidenced by opinion polls. is not represented at all. composed of nation-states, is also very high. liberal economists for their explanations. University Press, Cambridge and New York. Ashley, & Richard, K. (1986). The Poverty of Neorealism, in Robert O. Bull, H. (1977). The A n a rc h i ca l So c ie t y. London: Macmillan. ternational security. Cambridge University Press, Cambridge. 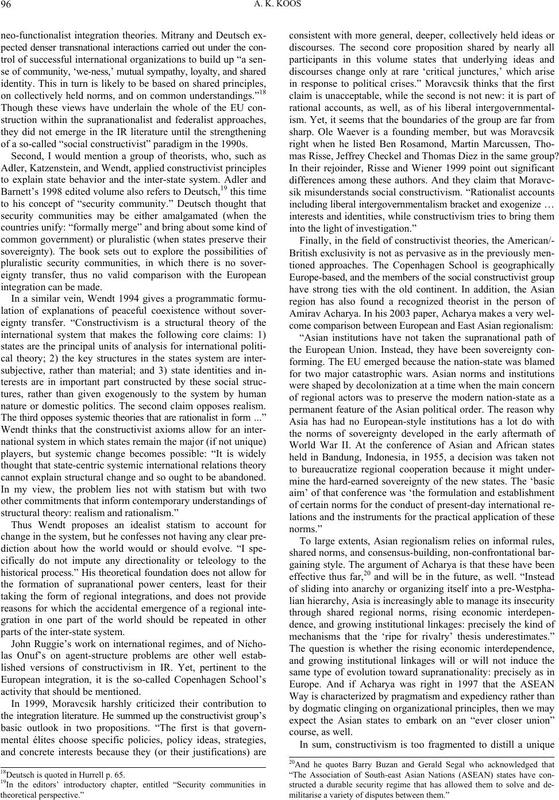 Journal of World Affairs, 12, 65-75. European Union repr e se nt a n n o f 1? ECSA Review, 10, 1-5.
and Its Critics, New York: Columbia University Press. New York: St. Martin’s Press, 1996, 83-106. Women’s Lives. London: University of California Press. gionalism: Theory and Practice. Plu t o P ress. ernmentalism. International Organization, 50, 269-99.
and Monetary Union in Europe. Security Studies, 6, 176-222.
tion. International Organization, 30, 173-212. 20, Yearbook of European Studies S.). Rodopi. lenge to Comparative Politics. West European Politics, 17, 1-30.
and the case of Western Europe. Daedalus, 95, 862-916.
today. Journal of Common Market Studies, 21, 21-37. Integration, Rowman & Littlefield Publishers, Inc.
politics. 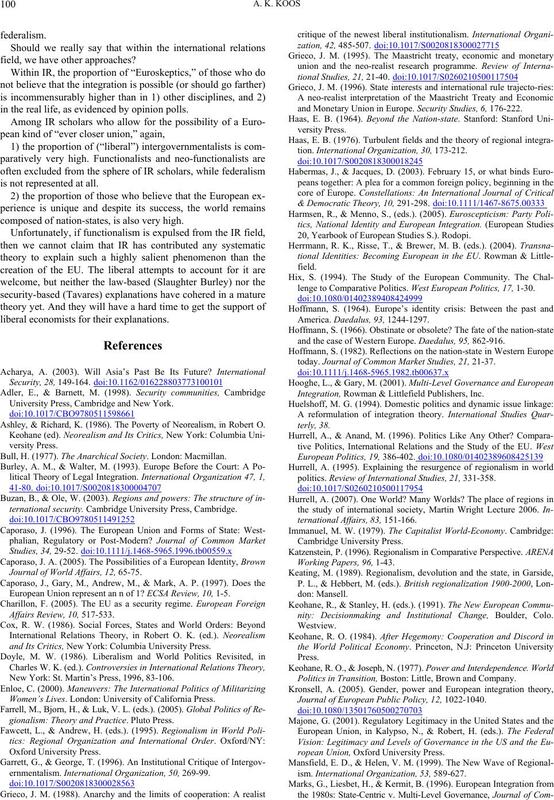 Review of International Studies, 21, 331-358.
nity: Decisionmaking and Institutional Change, Boulder, Colo. Politics in Transition, Boston: Little, Brown and Company. Journal of European Public Policy, 12, 1022-1040.
ropean Union, Oxford University Press. ism. International Organization, 53, 589-627.
mon Market Studies, 34, 341-378.
ing on an agenda? Feminist Legal Stu di e s, 10, 227-240.
the Cold War. Internation al Org ani zation, 15. Strengths and weaknesses. 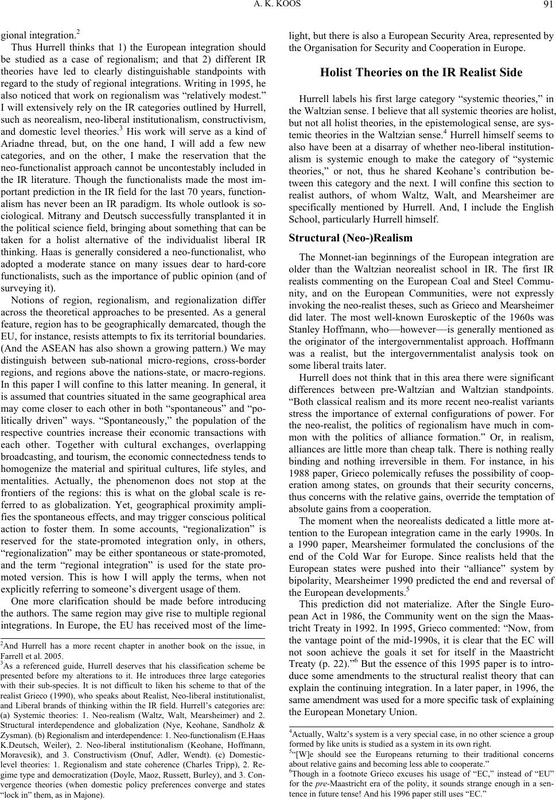 World Politics, 44.
interests and conventional statecraft in the European Community. International Organization, 45, 19-56 .
international politics. International Organization, 51, 513-53.
cal Economy), Cornell University Press. Moravcsik, A. (1999). Is something rotten in the state of Denmark? measurement. International Organization, 22, 855-880.
organization. Boston: Little Brown and Company. O’Neill, M. (1996). 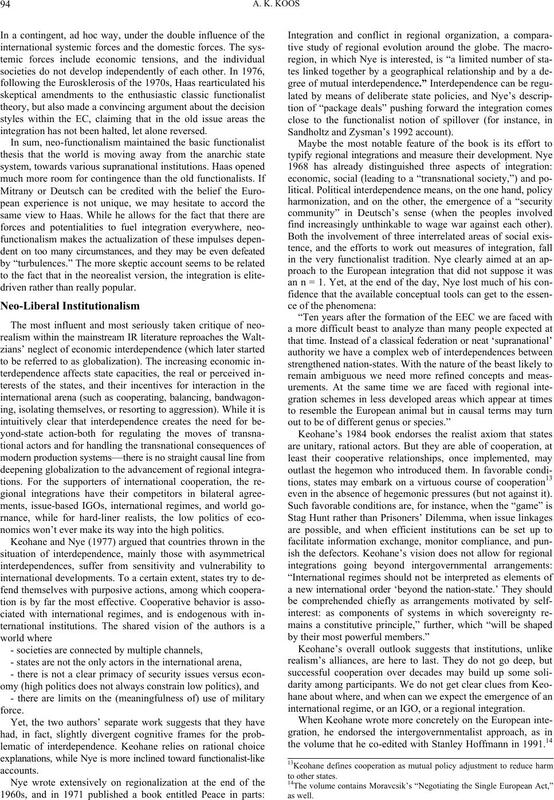 The Politics of European Integration: A Reader. gration. 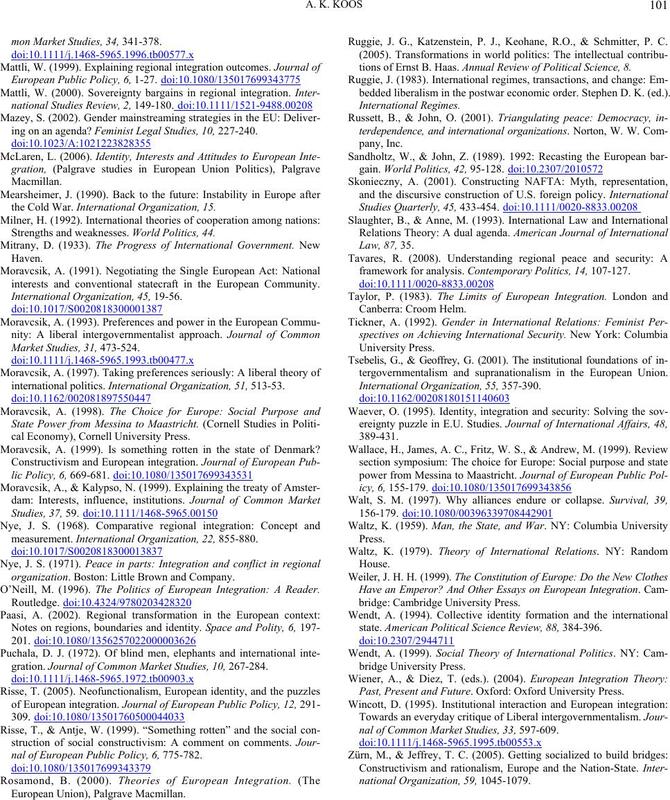 Journal of Common Mark et Studies, 10, 267-284.
nal of European Public Policy, 6, 775-782. Ruggie, J. G., Katzenstein, P. J., Keohane, R.O., & Schmitter, P. C.
tions of Ernst B. Haas. 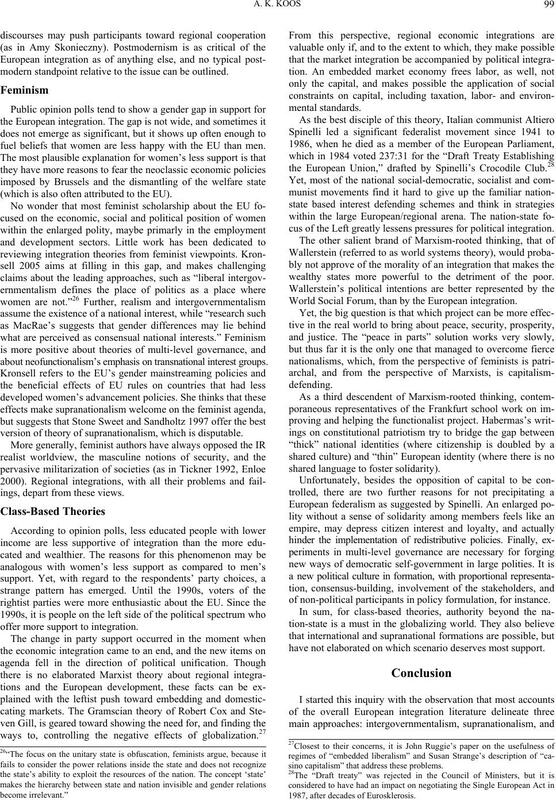 Annual Review of Political Science, 8.
bedded liberalism in the postwar economic order. Stephen D. K. (ed.). framework for analysis. 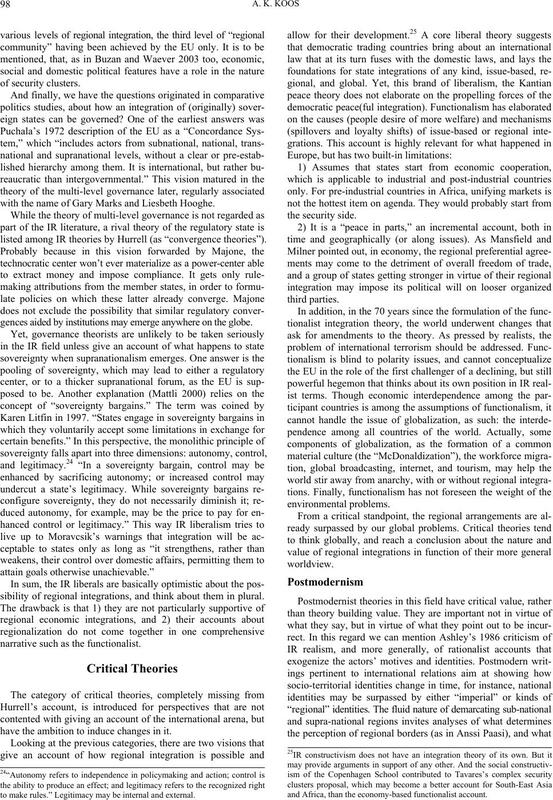 Contempor a r y P ol i t i c s , 14, 107-127.
tergovernmentalism and supranationalism in the European Union. state. American Political Science Review, 88, 384-396. Past, Present and Future. Oxford: Oxford University Press. nal of Common Market Studies, 33, 597-609.